Photo Galleries Beer & Buses Festival Aldridge Health Walk My Rotary - Fitting it in around work Youth Activities & Competitions Woodlands Family Adventure Day Get Involved My Rotary - No-one in my family had been in a service club Tree of Light My Rotary - I didn't think that I could afford it. Fun & Fellowship Rotary Shoebox Appeal Remembrance Parade Awards Santa's Grotto Annual Poppy Appeal Garden of Reflection Community Service Christmas Tree Festival Poppy Concert My Rotary - As the first female member in Aldridge Lend with Care Microfinance Are you interested in Joining Aldridge Rotary Club? 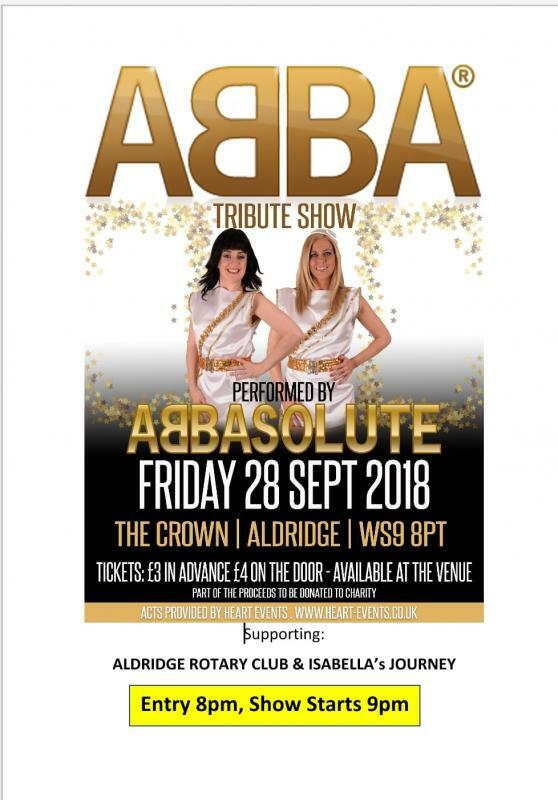 The event is supporting both the Rotary Club's Local Youth Project and Isabella's Journey. Tickets in advance £3 or £4 on the door. Available from Rotarians or at the venue.